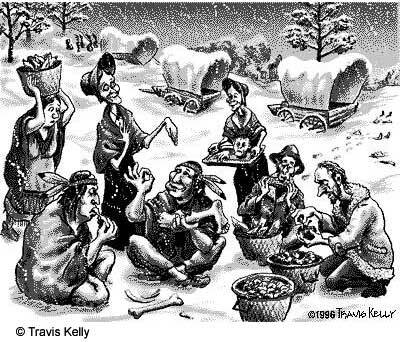 Unfortunately, many of the startups today are working with a travel plan somewhat similar to that of the Donner Party: “..we’ll head off in this direction and push through over the mountains -- and through hard work and perseverance we’ll make it to the promised land..”. If you’re going to have any chance of completing this journey today, you’ll need a well-prepared travel plan that’s somewhat more detailed than this. “Many people flooded into Silicon Valley in recent years, especially in the dot-com gold rush years, but technology entrepreneurs are not the first people to head west in search of a better life. People have been migrating west for as long as anyone can remember – and there are things that we can learn from their experiences. Today’s companies are drawn by the nurturing business environment and the skilled workforce of Silicon Valley. In the last century, good weather and farming land was enough to entice people to embark on a dangerous westward journey. Back then, the challenge was to find a good road map, select a route and travel plans that would enable you to get your family through the mountains before the winter storms arrived. Some people made it through without a scratch, others were not so lucky. Many years ago the California Star newspaper in San Francisco published a delicious account of the rescue of the Donner Party, a group of several families of migrants trying to cross the Sierras from Independence, Missouri to the Pacific in 1846 that ground to a halt mid-winter in the Sierra Mountains near Lake Tahoe. It told of how the lucky travelers had survived by eating the flesh of the other, less fortunate, members of the party and that when they were discovered they were actually broiling and preparing the body parts of close family members for a juicy meal. Seven point travel plan -- I’m confident that the Donner Party would have made it through in one piece if they’d put together a detailed travel plan based on these seven points. In fact, the principles of this travel plan can be applied to any other type of journey. In this chapter, you learn about the travel plan and how it can be applied to your startup. Picking your team – when you start a new business, you have to decide whether you want to go it alone or bring in partners. 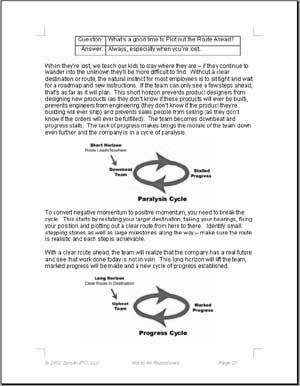 Here you learn when and how to go about bringing in partners and assembling the rest of your team. The hidden force – you learn about the force that drives companies to success and how you can harness it to your benefit. Fundraising process – here we cover the whole process of raising funds from investors. The chapter covers everything from formulating your pitch and targeting investors to negotiating terms and closing out the round. You receive sample voicemail scripts, do’s and don’ts, valuation guidelines and come away armed and ready to negotiate ratchets, redemption rights, co-sale rights and liquidity preference terms. Taking your bearings – you learn how to take your bearings and fix your company’s position in two simple steps. Picking the best route for you and your product – answer some simple questions to reveal the best route for you and your startup.